Kingston's historic Fort Henry was, for the third year, the host site of the Canadian Cross Country Championships. The beautiful, and challenging course had great racing that provided spectators with epic battles and a new set of National Champions. Kingston's infamous wind and unpredictable weather brought its own surprises for competitors. It became a day of many firsts for Lions Valley Athletics and its competing athletes. You will find Lions Valley Athletics Canadian XC Championship results and photos with other event highlights below. It was the first time Lions Valley Athletics sent athletes to compete in the Canadian XC Championships this year. The 3 person Masters Mens 40-49 Team consisted of Akeel Ghaib, Michael Gill, and Darryl Rowan. This has been Akeel's first cross country season ever and it definitely won’t be his last. 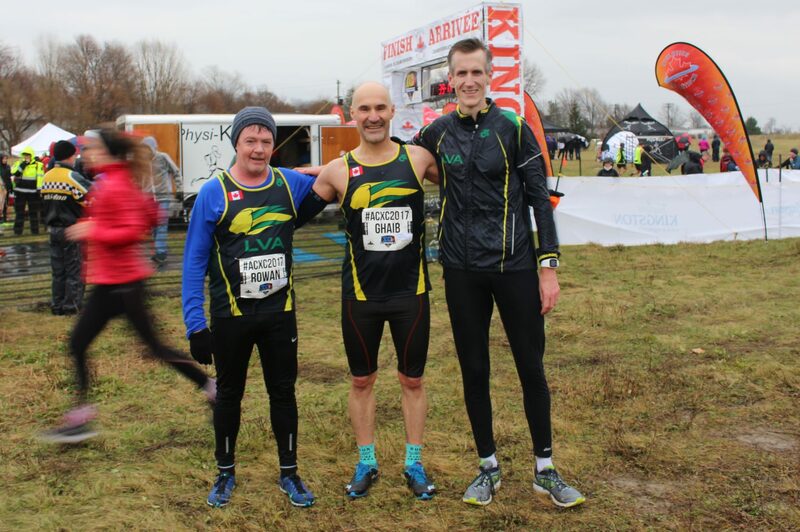 All 3 runners also competed as Masters at the 2017 National XC Championships for the first time. Previewing the course the day before, it looked like it was going to be a day of fast times, and ideal weather. Waking up on race day, it was clear Mother Nature had other plans as there had already been some light rain. The Lions Valley Athletics trio warmed up on the course before the 9:00AM race start. The Masters event had over 200 athletes registered to run, one of the biggest fields of the day. The 8KM Masters race distance consisted of 4 laps of a 2KM loop. The rain had stopped and the wind was blowing as it always does on this course as everyone completed some final strides. Leaders on the first of four 2KM laps. Leaders 1KM into the first lap. Michael Gill stayed at the front with the leaders for the first lap while Akeel and Darryl looked to find their rhythm. As the runners finished the first 2KM lap, the wind blew in some dark clouds and rain. A smaller group at the front in the first 500m of Lap 2. On Lap 3 the wind and rain was so strong, it was blowing Mikes singlet off his shoulder. Mike opens a bigger gap going into the final 2KM. After the first lap Mike took control of the race and started pushing the pace causing the front group to splinter very quickly leaving only 3 other runners near him at the half way point. With each lap came stronger winds and heavier rain, blowing Michael's singlet right off his shoulder and turning the course into a muddy mess. On the third lap, he opened a gap while the strong wind started sending the rain sideways forcing Mike to use the rope to keep himself upright around the slick hairpin turn. Mike maintained his position in the final 1KM, entering the finishing chute with a lead of about 20 seconds. Michael Gill won the Masters 8KM in a time of 27:12.0 becoming Lions Valley Athletics’ first National Champion. Darryl Rowan continued out on the course where he spent the last 2 laps running alone, separated from other runners by gaps in front and behind. He continued through the tough cross country conditions to finish 111th in 34:28.6. Darryl Rowan powering through a tough 8KM cross country course. Darryl on his final lap. Akeel Ghaib has had a spectacular premier cross country season that ended with his first Canadian XC Championship and longest race of them all. He didn't get excited and go out too hard, but instead saved his charge until the last kilometer where he ran his fastest split of the 8KM. Akeel ran 36:00.1 finishing in 8KM course in 129th position close behind Darryl. These three runners (Michael Gill, Darryl Rowan and Akeel Ghaib) made up Lions Valley Athletics Masters Mens 40-49 Team. Team results based on their total time of 1:37:40.8 put them in 6th place. Congrats to everyone on finishing in tough conditions and to Michael Gill on becoming the Canadian Masters Cross Country Championships winner. Luc Bruchet ran away from the field in the Open Mens 10KM finishing in 30:20 followed by Eric Gillis in 2nd and Charles Philibert-Thiboutot 3rd. The Open Womens 10KM played out very differently with a group of 4 trading the lead throughout the entire race. In the final 500m it was local Claire Sumner who took the Canadian Championship followed by Victoria Coates, Rachel Cliff, and Natasha Wodak iin 2nd, 3rd and 4th respectively, all separated by 19 seconds.